Wallowa Resources provides leadership on natural resource, economic and community issues, creating opportunities for sustainable land management, ecosystem health, family-wage jobs and community well being, and preserving Wallowa County's rural way of life for future generations. Since its formation in 1996, Wallowa Resources has worked to bring people together in a common goal: to blend the ecological needs of the land with the economic needs of the community. The non-profit group strives to balance Wallowa County’s economic well-being and the proper use of its resources, preserving the area’s heritage of making a living from the land. Today, working with key agencies and private citizens, Wallowa Resources is making a difference in the long-term economic and ecological health of Wallowa County. In the process, this community-based group has become a model for other rural communities to follow. 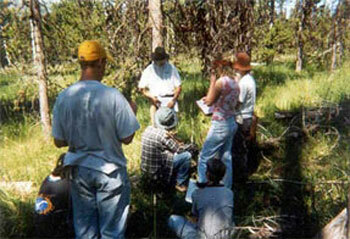 In 1999, Wallowa Resources was amongst the first groups in the nation to sign a Memorandum of Understanding with the United States Forest Service which commits both parties "to work cooperatively to demonstrate new watershed management approaches that improve and restore the ecosystem health of the Wallowa-Whitman National Forest. Wallowa Resources works with many partners on projects that balance ecology with economics. Projects fall under several categories: range stewardship; riparian restoration; forestry stewardship; and research, monitoring, and assessment.